The phrase on everybody’s lips is “weather window”. Bora Bora is the principle place to check out of French Polynesia before sailing on towards Tonga. The winds for the passage have not been great for the past few weeks so a bit of a yacht bottle neck is building up. Obviously all the crews here are individuals with an adventurous streak or they wouldn’t be sitting in a small floating home half way across the Pacific, it is strange observation then, that they clump together so. The word will go out that the weather looks good, people stop looking at there own weather forecasts and there will be a mass exodus. It’s the same with anchoring when we arrived in this bay it was empty except for a couple of charter boats out near the reef, we anchored in deeper water and spent a couple of days in splendid isolation. Then a couple of friends arrived and we created a group of three boats, immediately every boat that entered the bay seemed to stop looking at their own charts and instead just anchored nearby us. At one point there were about ten yachts all anchored on top of each other and the rest of the large bay was empty?! The weather looks quite good to leave in a couple of days but this window of opportunity has caught us napping and it would mean rushing around for two days and we don’t really fancy competing with every one else for a spot at the fuel dock or that last tomato at the supermarket. So we may well stay a bit longer, hardly a hardship. 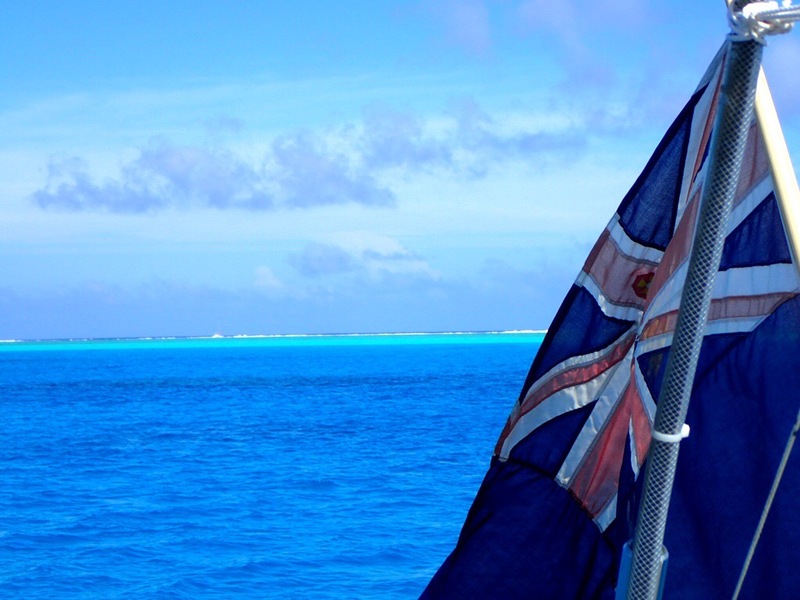 We are anchored in Tehou Bay, in the lea of Toopua Island in the SW corner of the Bora Bora lagoon. We are again in clear turquoise water, with green hills to shore and a dramatic white line of surf out to sea. When we arrived on Tuesday, having dropped the anchor carefully to ensure we weren’t going to snag on any coral heads, we jumped into the water and a school of twelve spotted eagle rays glided slowly past our feet. I love them, they are so graceful and have friendly faces a bit like a dogs. Out on the reef the tourist boats come to feed sting rays and black tips and to the south of us is a line of luxury, over the water, Hilton villas. Our only real issue is again lack of Internet, the only place we are finding anything is in the restaurants and with the eleven hour time difference back to the UK it is making communication quite difficult. In Tehou bay we don’t even have much of a phone signal. Luckily Bora Bora is quite small so we can easily run back in to town. Wednesday night we decided to go back for Happy Hour at the yacht club as the guitarist from last week was to be there again. It was only about 2nm if we cut the corner off the main channel, so we took the iPad and recorded our track winding through the coral heads while it was still light and then followed the track back later that evening in the dark. It was quite exciting whizzing blindly through the night, Rick driving, me directing – right a bit, left a bit, LEFT A BIT MORE! Thursday night Lili and Steve from Liward and Steve, Linda, Karen and Peter from Nina came onboard armed with meat, salad and beer and we had a BBQ. As the sun went down Steve broke out his guitar and we all, loudly, sang the night away, more enthusiasm than talent on the vocals, maybe that will teach people not to anchor quite so close to us. The next morning all a little worse for wear we took the dingies around the south of the island to a snorkelling spot. The day was calm, the water so clear and so blue we could see the coral ten meters down as if it was at the surface. There was quite a strong current running over the buoyed bank of coral, the trick was to swim hard against the flow to one side and then drift back over all the fish and repeat until you are exhausted. 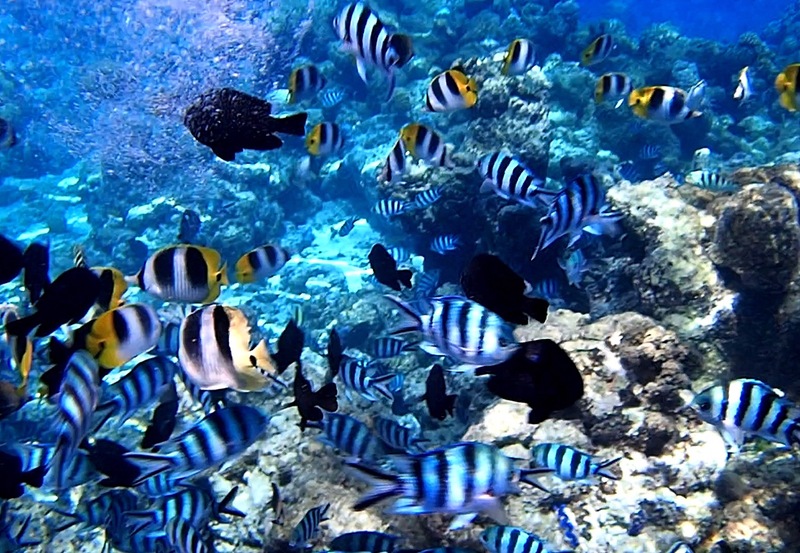 It amazes me that having been here for over three months, that we are still seeing new types of fish each time we snorkel, the star today was a roundish fish, about the size of a large serving platter, brown with green stripes and a large green stubby nose? Linda had bought the remains of last nights pasta salad, this was very popular with the smaller reef fish and caused a mini feeding frenzy all around us. Perhaps because of the night before or the strength of the current, we all tired quite quickly and we returned to our dingies and went over for lunch at Bloody Mary’s Restaurant. 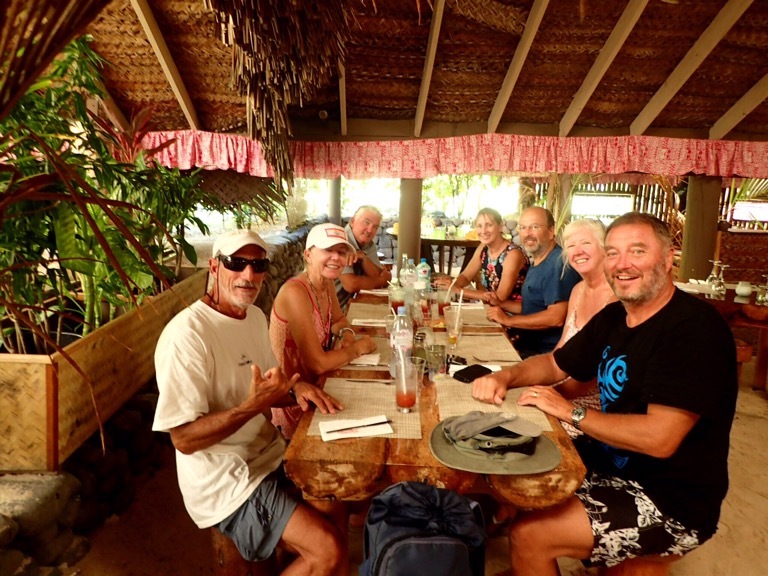 It is famous on Bora Bora, built in Polynesian style with thatched roof and sand floors, it’s been wowing its customers for over forty years. At the entrance they have two boards listing all their famous visitors, it seems everyone has been from Rod Stewart, to Diana Ross, to Cameron Diaz to Buzz Aldrin. The Bloody Mary’s were spicy, the burgers good and the wash basin in the ladies a waterfall, but no famous faces we could recognise. Between the fun there are still the routine jobs to do. Today one of our least favourite – cleaning the hull. After the fast growth rate in the Galápagos and Marquesas, the hull in the Tuomotu kept surprisingly clean so we have had a bit of a reprieve but it has been gradually getting worse again as we have sailed west. Close up we saw it had grown a whole eco system over the last couple of weeks. So I cleaned the thick green slime from the waterline, while Rick put on his scuba gear and tackled the fuzz of weed and barnacles that were making our keel and rudder thier home. With the hull pristine we should fairly fly to Tonga. Until then, here we sit awaiting the next weather window with our name on it. This entry was posted in Passage making, Tahiti and the Society Islands by Roz. Bookmark the permalink.